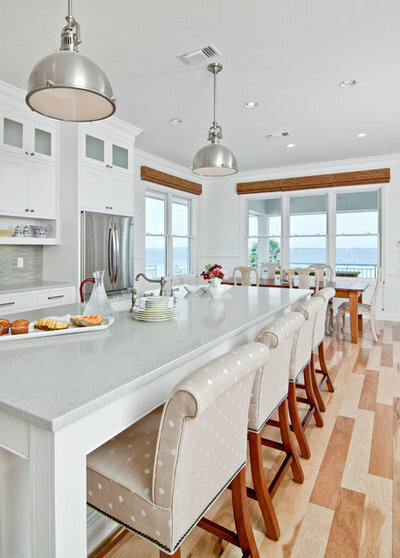 If you're looking to outfit a beach house, or just make your house have that casual beach cottage look for summer, look no further. 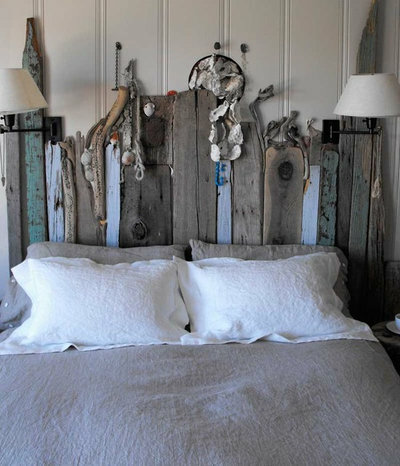 Here's a roundup of some of the best examples of sea-inspired products, cottage rooms, and an explanation of what makes them so darn beachy. 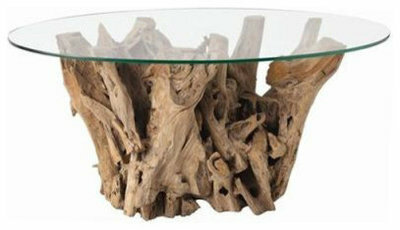 Driftwood: The market is full of all kinds of great driftwood products, whether it be a vintage-inspired driftwood lamp with a crisp white shade, a driftwood coffee table, or a driftwood mirror frame. 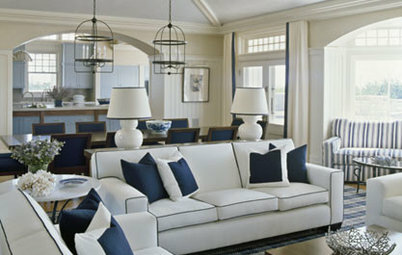 Blue and white: Whether it's stripes, florals or a shell print, you cannot go wrong with any shade of blue with white in a coastal cottage. 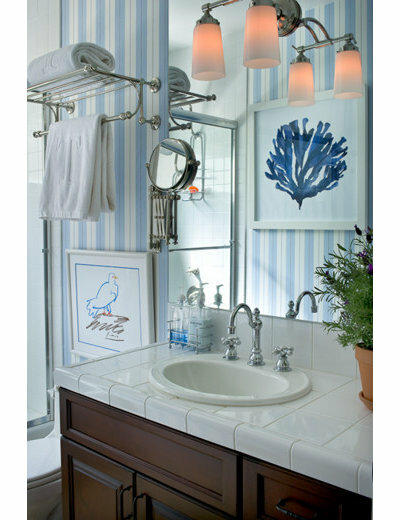 Blue-and-white striped wallpaper and blue coral painting give this bathroom an airy breezy style. 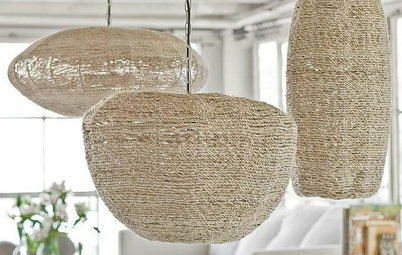 Wicker, rattan, woven textiles: Natural fibers are key in achieving a beachy vibe. 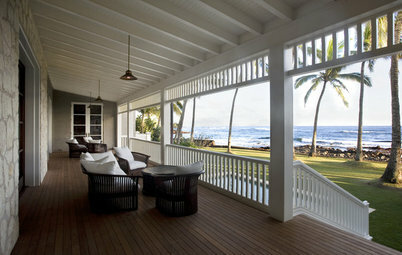 Wicker and rattan furniture and seagrass rugs add coastal texture. 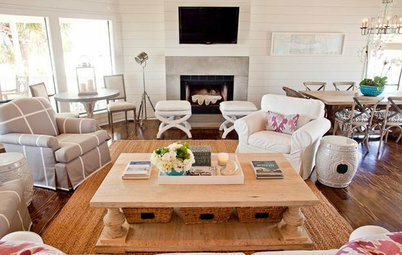 Woven chairs pack a beachy punch in this living room, giving it a more casual vibe. 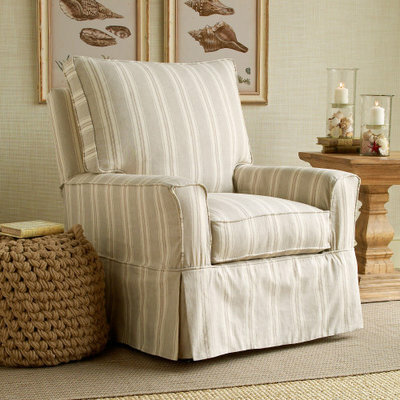 Casual Slipcovers: Whether it's ticking stripes or plain white, a slipcover automatically relaxes the mood; loose covers help everyone relax about sitting on the furniture with a slightly damp or sandy bathing suit. 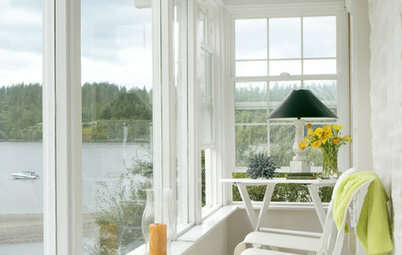 Slipcovers also make a cottage much more kid-friendly, as it should be. 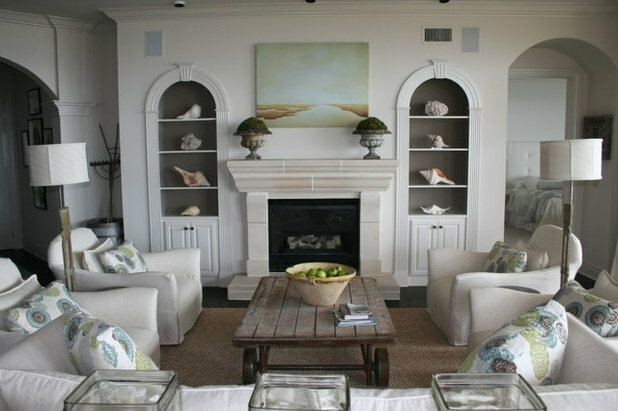 Shells: It wouldn't be a beach house without at least a shell or two. 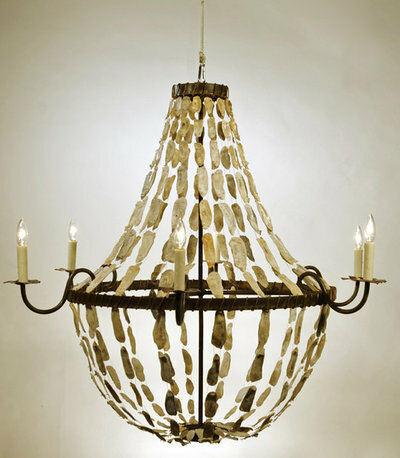 This chandelier is a great way to add shells to the decor without creating clutter. 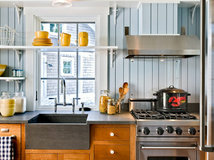 Tip: Use shells from a collection sparingly. 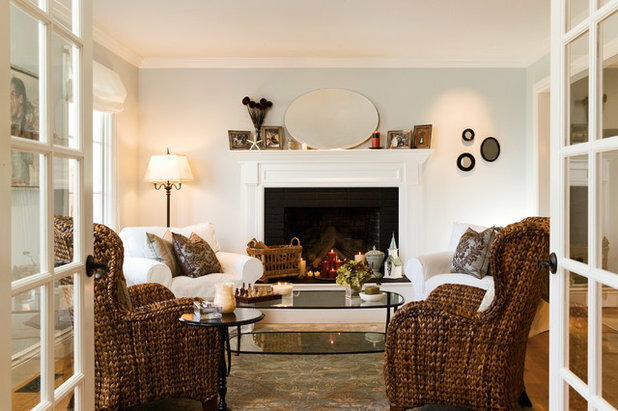 This designer used just a few favorite shells from her client's collection and painted the walls behind them gray. The result is that they stand out and get the attention they are due. 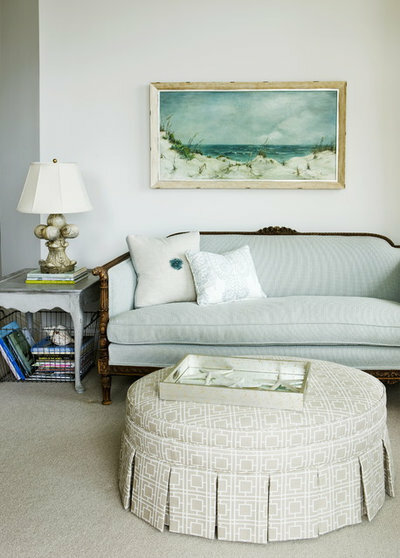 Coast-inspired art: All things from under the sea (like fish), over the sea (like classic clipper ship prints) and near the sea (dunes) are a great fit for a seaside spot. 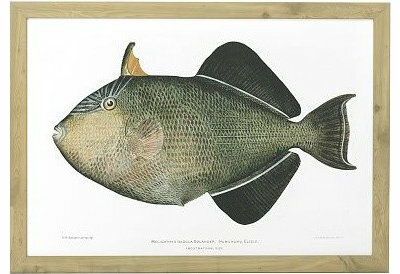 Tip: Look for plates of "shelltanicals" on sites like eBay and Etsy, or even old books full of them. 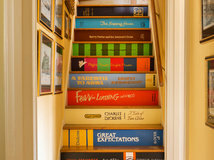 Put them in identical frames and you have an instant cottage art wall. 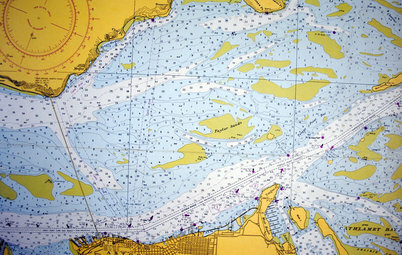 Whether it's a fine oil painting or a kitschy paint-by-numbers, anything beachy or nautical goes. 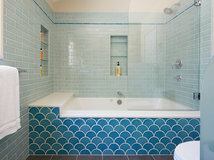 Clear and colored glass: Whether it's a sea glass collection, found bottles, or hurricanes, glass is a wonderful texture to add to your beachy scene. 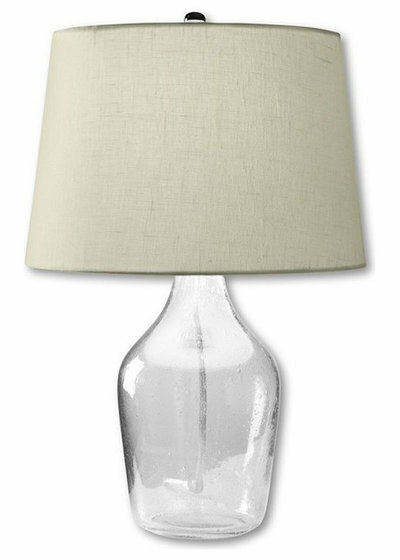 In addition, clear glass lamps take up less visual space, unless you feel compelled to fill them with your shell collection. 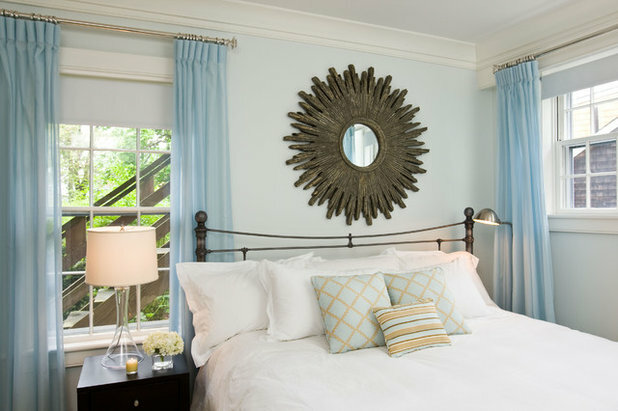 This small bedroom takes full advantage of a clear glass lamp. 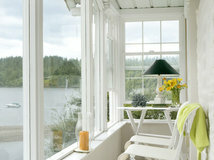 "Cottage" often implies very small bedrooms, often without closets. Since space is at a premium, you'll need to use it wisely. 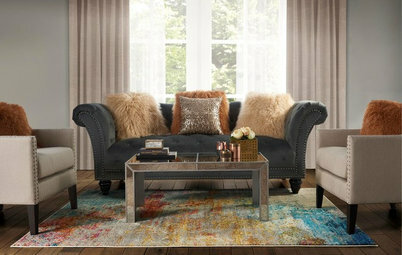 This room eliminates the need for two bedside tables with a floor lamp on one side. 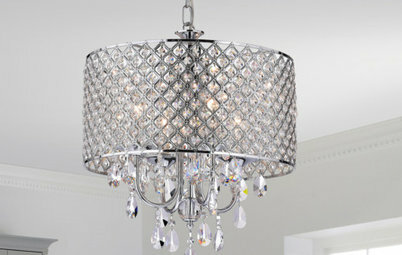 The clear glass lamp saves visual space, and the light palette makes the room look bigger. 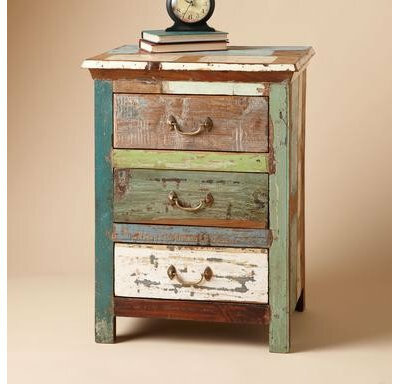 Tip: Speaking of bedrooms, a good space-saving trick is to use bedside tables with lots of storage; some bedrooms are too small for dressers. 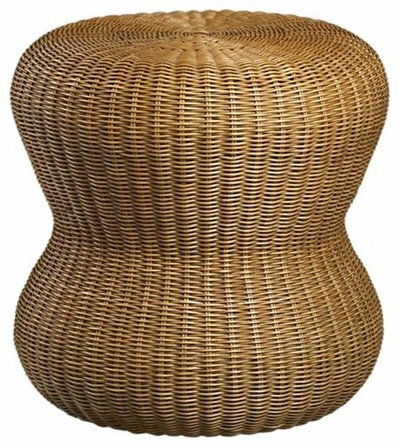 This eclectic one from Sundance is one of my favorites and is big enough to fit a week's worth of t-shirts, PJs and unmentionables. 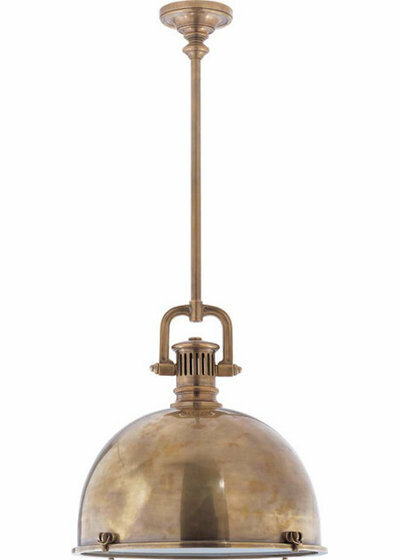 Nautical pendant lamps: Take a cue from old ship lanterns when seeking light fixtures. 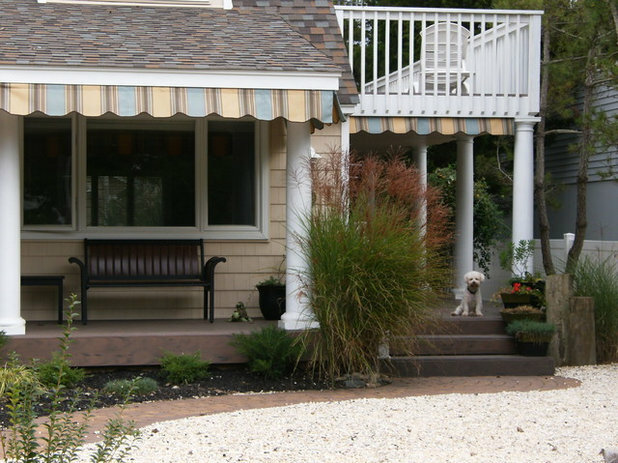 Awnings: These outdoor window treatments are a great opportunity to add color, stripes, and most important, ruffles to your cottage's exterior. 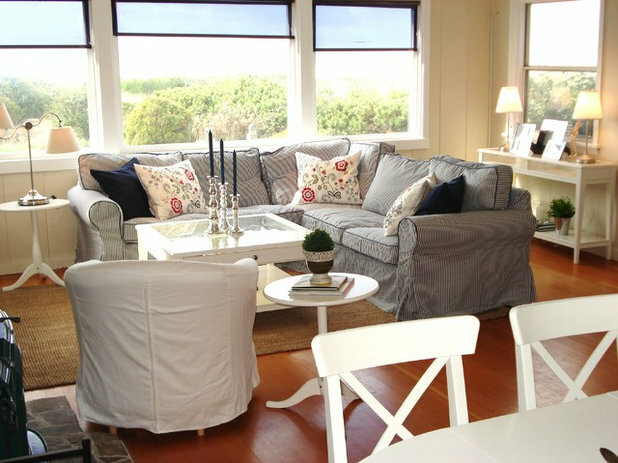 These awnings to this cottage are like mascara is to eyelashes — that final flirty touch. 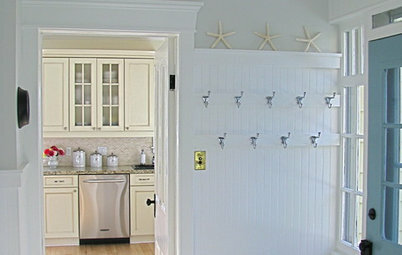 Do you have any favorite beachy decor items around your home? Please share with us in the comments section. 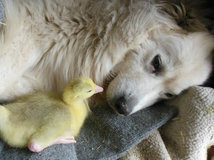 That had better be one helluva comfy pillow. I've been having deja vu and I remembered why! 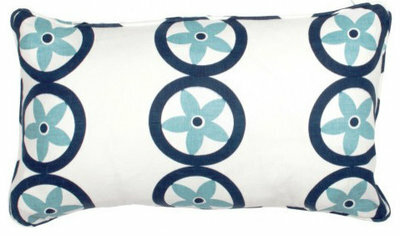 There was lots of web buzz about Carrie Bradshaw's $300 pillow in the first SATC movie on the design websites.